One of the first things I ever learned to make was pie crust. I’ve known how to make it for as long as I can remember. Every year, the night before Thanksgiving, we have Pie Night. Pie Night is a holiday on its own. It’s the night where the women (and some brave men) of the family get together, make all of the pies for the next day (usually about a dozen, all different flavors), and prepare whatever else can be made ahead (cornbread, crusty bread cubes, potato chopping, etc). Then we eat Build-Your-Own, which is basically a Chipotle Burrito Bowl before Chipotle was a thing. Then we keep on cooking. It’s really where I learned to cook. And still one of my most treasured memories. I have attended pie night for as long as I can remember, and have participated in the baking of pies since my hands have been able to hold a spoon. So kind of a long time. My Aunt Debby always made the pie crusts. She would stand at the food processor covered in flour all night, rolling out crusts for all of the pies. And the crusts always turned out perfect. Flaky and soft, delicate, but not flimsy. Everything you want a pie crust to be. Somewhere along the way, a “Pie Night Recipes and Other Trade Secrets” cookbook was made for all of the women in our family so that we all have a copy of all of the Pie Night recipes. I refer to it all the time for our classic family recipes. Aunt Debby passed away a couple of years ago, but we still have pie night. And we still use her pie crust recipe. It’s the only one we will ever use. It truly is the best pie crust ever. The original recipe used Crisco shortening, but knowing what I know about trans fat, I now use butter or coconut oil, which is not hydrogenated like shortening is. 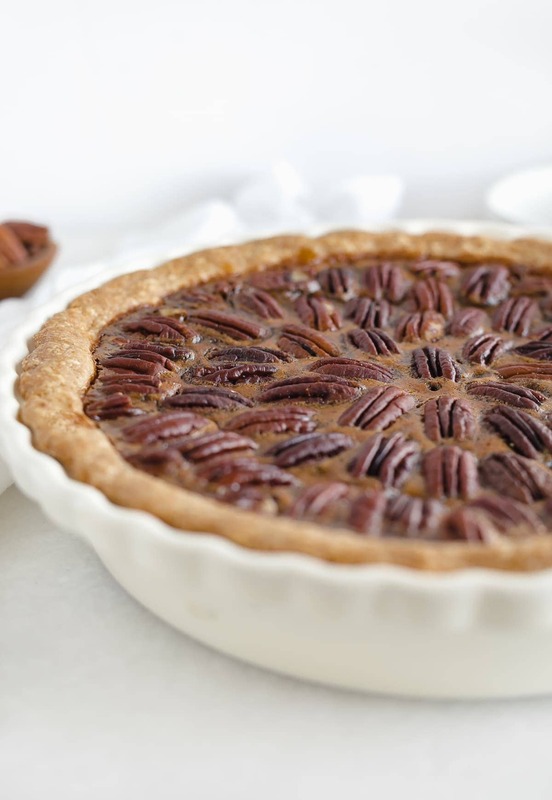 It results in the same flaky crust that is perfect for apple, pecan and pumpkin pie. The only thing missing is the sweet loving touch of Aunt Debby. I use white whole wheat flour in place of all-purpose flour for a delicious, nutty whole wheat pie crust. The flavor is delicious, and you get a little extra fiber in with your Thanksgiving pies! 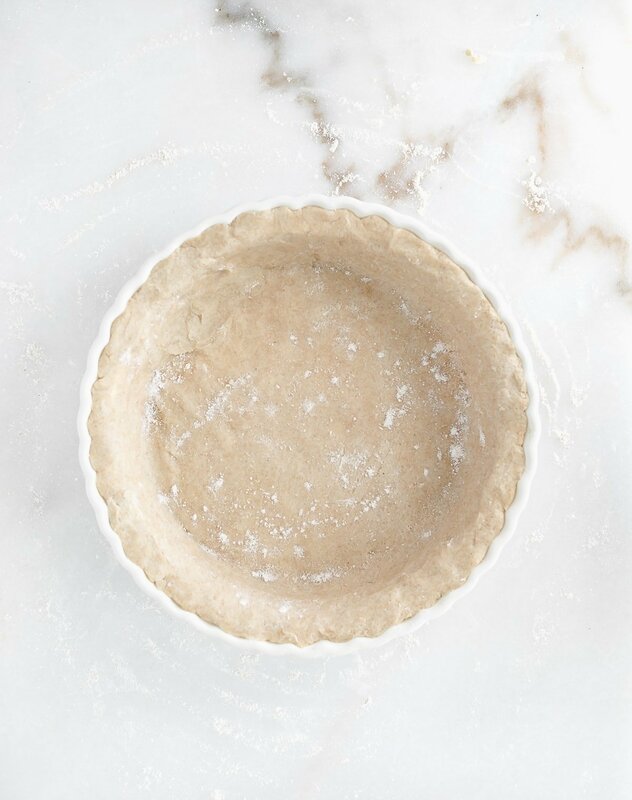 A tender, flaky whole wheat pie crust made without shortening. It’s the perfect all-purpose base sure to make any pie more delicious and nutritious! In the bowl of a food processor, add flour, salt, and butter. Pulse a few times until pea-sized pieces form. Slowly add 1 tbsp of water at a time, stopping when you fill up your spoon with water. Pulse and continue to add water until a ball has formed with the dough. Turn out the dough onto a floured surface. Cut the ball of dough in half into two smaller pieces. Roll out dough on top of saran wrap, one ball at a time, to form the crust. 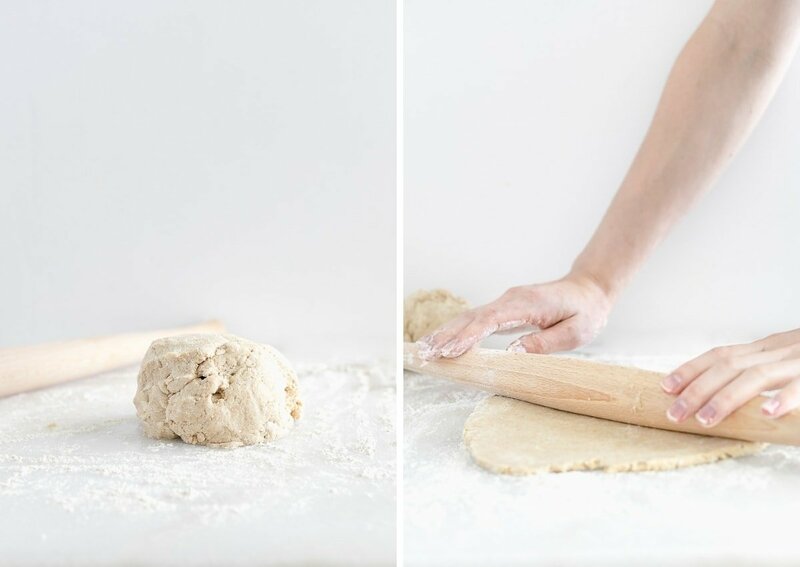 Turn out into your pie pan and shape the edges by pushing your thumb of one hand into the thumb and pointer finger of your other hand on opposite edges of the dough and work all the way around. Continue with your pie recipe as intstructed. You’ll get a top and a bottom crust. You can freeze one if your recipe only calls for a bottom crust. The original recipe made with all-purpose flour uses 5 tbsp of water. If you are using all-purpose flour, reduce the water to 5 tbsp. Loved Aunt Debbie- we discussed it being Pie Night around the corner earlier today!!! Great family memories you guys have- HAPPY THANKSGIVING! Don’t we need to let the dough rest for an hour before rolling it ? You can certainly rest it in the refrigerator for 30 minutes to an hour before rolling if you’d like! You mean it doesn’t affect the texture of the crust, if we roll it straight after making the dough ? As long as the butter is nice and cold before using (you could freeze it if you’re concerned) and you work fairly quickly, it should be fine. can salted butter work in this recipe? Yes, just omit the salt from the recipe.